Dr. Rodriguez performed a Body Lift on this female patient in her 40's. The procedure consisted of a Tummy Tuck, an outer Thigh Lift, and a Buttocks Lift. 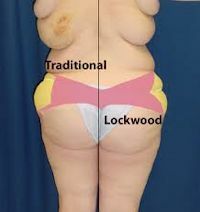 The patient had a dramatic change in her body profile with this procedure, which took inches off and gave her entire figure a tighter appearance. The body lift includes a Tummy Tuck (abdominoplasty), a Thigh Lift, and a Buttocks Lift in the same surgical session. Dr. Rodriguez has over 20 years experience with Body Lifting techniques. He is Board Certified by the American Board of Plastic Surgery.